“On February 10, the Joan Ganz Cooney Center held a launch party at Zynga’s headquarters in San Francisco for gamesandlearning.org, a website devoted to bringing together the latest in industry news, game-based learning (GBL) research, commentaries from developers, market trends and funding opportunities. “…create a committee to examine how interactive gaming can boost student involvement and achievement, and create a pilot program for integrating games into K-12 curriculum. 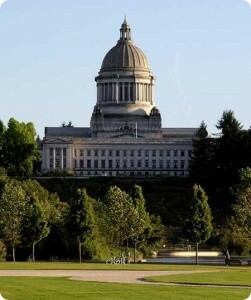 The bill was heard Wednesday in Olympia by the Senate Committee on Early Learning & K-12 Education. Sen. Sharon Brown, R-Kennewick, one of the bill’s co-sponsors, said interactive video games could add to the diverse learning styles of today’s classrooms. Sen. Rosemary McAuliffe, D-Bothell, thinks interactive gaming will give students the opportunity to learn while enjoying a game, something she experienced while visiting students of Washington Virtual Academies (WAVA), an online K-12 curriculum program used by the Monroe and Omak public school districts. Studies from the University of Washington’s Center for Game Science show interactive games can promote creativity and enhance knowledge of science and technology-based fields among students. Seattle attorney Matthew Hooper testified about academic-based gaming in schools. A report from the Entertainment Software Association indicates 95 percent of American children — and 97 percent of teenagers — play video games, he said. By the time an average person reaches age 21, he of she has spent more than 10,000 hours playing video games, according to the Pew Research Center’s Internet and American Life Project. Hooper also cited a brain-based research study by Stanford University professor and neuroscientist Brian Knutson that analyzed the effects of educational video games on youths. : An act relating to the interactive gaming in schools public-private partnership. : Establishing the interactive gaming in schools public-private partnership. : Senators McAuliffe, Litzow, Hargrove, Hill, Billig, Fraser and Brown. Committee Activity: Early Learning & K-12Education: 1/22/14. : Advances in interactive gaming technology have spurred a recent scholarly focus on how interactive games may be used to engage students and improve academic achievement. For instance, the Center for Game Science at the University of Washington has published several studies on the application of interactive games in education, specifically how interactive games can promote creativity among students; enhance student knowledge of science, technology, engineering, and technology (STEM) fields; and improve critical thinking skills through cognitive skill training games. Summary of Bill: Interactive Gaming in Schools Public-Private Partnership (PPP). PPP is established, composed of the following members to be appointed by August 1, 2014: four legislators, one member from each caucus of the House and Senate, appointed by the presiding officers of each chamber; four experts in the integration of interactive technology or gaming into education, one expert to be appointed by each caucus of the House and Senate, and appointed by the presiding officers of each chamber; a representative of the Department of Early Learning (DEL), appointed by the director; and a representative of the Office of Superintendent of Public Instruction (OSPI), appointed by the Superintendent of Public Instruction. the organizations participating in PPP. Legislative members of the partners hip must receive per diem and travel expenses, and nonlegislative members may be reimbursed for travel expenses. PPP is tasked with examining how interactive games may be integrated into primary and secondary education to increase student involvement and achievement. PPP must consider how interactive games and advances in technology may be integrated into curricula from early learning through grade 12, and develop a proposal for a pilot program to integrate interactive gaming in schools to be submitted to the Legislature by December 1,2015. The statute authorizing PPP expires on January 1, 2016.
: Ninety days after adjournment of session in which bill is passed. : PRO: Games are al ready being integrated into curricula in order to engage students. Students love the games and are excited to even use the games at home each night. Ninety-five percent of children play video games, and the average time of play is over two hours each day. A scientific study from Stanford showed that educational, interactive video games engaged regions of the brain associated with motivation, learning, and memory. In 2012 the Clark County, Nevada school district tested a program in which interactive video games were integrated into low-performing schools. The schools using the games more than doubled their improvement on assessments compared to schools that did not use the assessment. In San Jose, there is a school that integrated interactive media and video games and has particularly notable success with English language learners. Most of the interactive game systems are set up in computer labs in schools, so students do not always require a computer or iPad of their own to participate. : PRO: Senator McAuliffe, prime sponsor; Matthew Hooper, attorney. “Interactive games are set to be the new frontier in education for healthcare professionals (HCPs) according to a leading expert in e-learning. Speaking at the European CME Forum in London last week, Prof Peter Henning of Karlsruhe University in Germany explained that making learning “fun” could reverse a declining trend for the use of e-learning as part of continuing medical education (CME). “Current mainstream CME e-learning courses are nice, but the number of participants is going down,” said Prof Henning, references such examples as an online eye surgery video/text course at the Virtual University of Bavaria that has just 56 participants. Instead, the use of ‘serious games’ with learning aspects should be considered as an alternative, said Prof Henning, noting that gaming has long been used as a form of education. These included the INMEDEA Simulator, which allows HCPs to example virtual patients in an online clinic, and a programme designed by Line Communications that educates doctors on the classification of bone fractures via a goal-based approach that incorporates time challenges and other gaming elements. The hardware for gaming could also be beneficial in healthcare education, according to Prof Henning, who noted the potential of the Microsoft Kinect – a piece of kit for the Xbox console that recognises body movements. To read the full article by Clelia Rivera click here. Ned Smith writes about how Course Hero makes a game of learning. “Learning can be fun when you make a game out of it. That premise underlies the decision of an online learning platform to use game mechanics to engage college students. It works by motivating students to join, participate, contribute and share their successes. 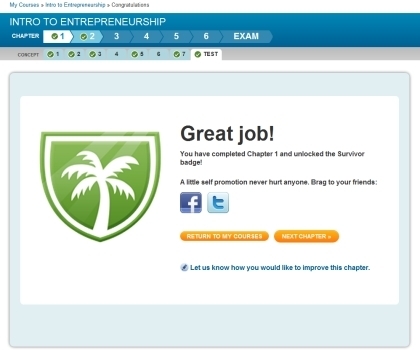 Founded in 2007, Course Hero is an online learning tools resource designed to help college students discover a more efficient and productive learning experience. Gamification technology that uses badges, leaderboards that display rankings, social sharing and rewards is integrated throughout the site’s four core offerings: Courses, an extensive series of custom-designed lessons organized into three learning paths, entrepreneurship, business, and Web programming; Flashcards, interactive learning tools on a wide array of topics; Tutors, which connects students with experts on hundreds of subjects; and Study Documents, a library of study guides, lecture notes and practice problems.